The Cornetto Trilogy concludes with a film that takes a deep look at getting older and not finding ones way in life… While fighting alien robots from space. Director Edgar Wright gets the band back together for an emotional rollercoaster of a film that takes a heartfelt and endearing message and wraps it in a science fiction homage that entertains on every level. Simon Pegg plays Gary King, a man whose life hasn’t reached the heights he hoped it would and decides to get his high school friends back together to relive the one night of glory he treasures most from his teenage days. The script really shines here with clever dialogue and witty banter that showcases each actors strengths. Each member of the cast give their characters so much depth that the goofiness never overtakes the heart of the story. The film starts with Gary deciding to undertake a pub crawl he failed to complete twenty years ago, after a group therapy session causes him to look back on his life with regret. It is from here that he visits each of his old friends and spins an hilarious web of deceit to get them all to agree to make the trip to their old home town for one last wild ride. The goal is to have twelve pints in twelve pubs culminating at a pub called The World’s End. As a buddy comedy about the turns life takes and old friends looking back on wether or not you can go home again, the film would be worth the price of admission. However the movie makes a big reveal at the halfway point that takes the film in an action packed direction. The town has been taken over by an other worldly intelligence that seeks to improve humanity by replacing it with robots. Only they aren’t really robots,as the film will explain over and over. If you were ever curious about the true meaning of the word robot then this movie is for you. The films cranks it up to eleven as our heroes try to out wit the alien robots all while being drunk beyond reason. As the jokes and action fly by at break neck speed the movie does take time to rest and let the characters breath at key moments. It is these moments that give us deeper insight into each character’s inner struggle. Each character has his own demons to face and the film uses the alien invasion as a visual symbol to drive the narrative and represent the characters own motivations. This movie has heart, action, and the funniest story I have seen in a long time. The ending, which I won’t give away, was bold and left me wanting more. 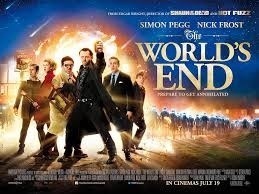 The World’s End is a must see. This entry was posted in Movies, reviews and tagged Edgar wright, movies, Nick Frost, reviews, Simon Pegg, the worlds end. Bookmark the permalink.